8 Reasons Why Canvassing Can Make a Huge Difference in the Midterms (& Beyond)! The primary is behind us. We know which candidates will be on the ballot. And there are many reasons to be hopeful that we can finally break the Republican supermajority in the NC General Assembly – and possibly even take back the NC House altogether. But canvassing will play a crucial role in this election. Here’s why. 1. Democratic voter turnout is the key. By “Democratic voter,” we mean both registered Democrats and left-leaning Independents who are likely to vote for Democratic candidates. This is a “Blue Moon” election year in NC, with no Presidential or US Senate races to bring people to the polls. This happens every 12 years, and turnout is usually incredibly low: Just 37% of NC voters participated in 2006 (vs. 69% in 2016 and 44% in 2014). Virginia has shown us the way. Following massive voter turnout efforts, votes for Dems more than doubled from 2015 to 2017 (while GOP votes increased by only 30%), resulting in a Democratic pick up of 15 seats in the Virginia House of Delegates. To win big in 2018, we don’t need to change anyone’s mind. We just need to get Dem voters to polls. 2. We’re strategic about where we’re canvassing. We’ve identified the most flippable districts in 2018 based primarily on prior election outcomes in local, state, and national races. In other words, we are canvassing where we can be most effective, and we are encouraging everyone to do the same. No need to waste valuable volunteer resources in areas that are deep blue or deep red. We’ve given a strategic value to each of the more than 2,700 precincts in the state based on the competitiveness of NC House, NC Senate, and US House races. And we’ve identified where voter outreach is most needed based on voter turnout. 3. Our goal is extremely achievable. We only need a 7-point Democratic wave in 2018 in the most closely held GOP districts across the state to flip 15 seats (the same number Virginia just flipped) and break the Republican majority in the House. By contrast, the top two targets in the US House (District 2 and 13) require a 13-point swing. 4. There are flippable districts across the state – from the mountains to the coast. Which means volunteers can make a huge difference without going far from home, no matter where they live! 5. We can double or even triple our impact. There are flippable NC House/Senate districts in all 13 US House districts. So when you canvass, you are making a difference in multiple races! 6. Flipping the NC House would make a difference on the national level. If we can get a seat at the table when it comes to creating new legislative maps in 2020 (after the census happens), NC’s congressional delegation in D.C. would be evenly divided 7-7 instead of 11-3 – a 4-seat gain! 7. Canvassing is a conversation. You’re not doing a “hard sell” on a candidate. When you canvass with FLIP NC, you’re not knocking on the doors of people on the far right. You’re asking the person on the other side of the door – a Democratic voter who may participate sporadically – about the issues they care about. You’re having a back and forth about your shared values. Research shows that a voter needs about three of these interactions in order to be mobilized to vote. 8. Canvassing works. In fact, it’s the most effective tool we have in our voter outreach tool belt. In looking at the data from the May 2018 primary, the people FLIP NC have canvassed thus far were 2.2 times more likely to vote than those we haven’t reached yet. With less than five months until Election Day, we can feel the progressive momentum building. We must take back the NC House to restore fair legislative and congressional maps for the next decade. By coordinating our efforts and harnessing the incredible grassroots energy across the state, we can win in November. Join the coalition, and let’s get to work! Here is a list of our upcoming canvasses. RSVP and join us! If you are unable to give of your time but want to support us, make a financial donation. 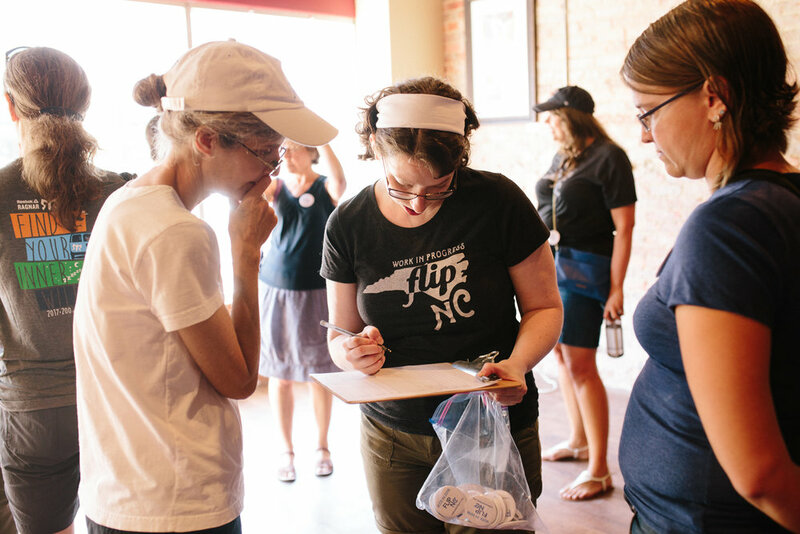 We use donations to develop events around volunteer recruitment and to create materials that our canvassers will distribute as they knock on doors to educate voters about this crucial time for North Carolina democracy. If your group would like to canvass but needs some help, let’s connect! You can reach us via email, Facebook, or Twitter. We can provide any support you need to start, build, and sustain your efforts. That includes helping to identify the best places to work; providing training, materials, walk sheets and call lists; assisting you as you lead your first canvass; and offering ongoing support.